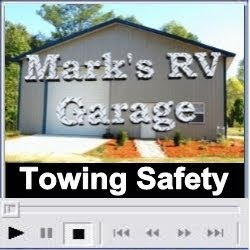 RV 101® Education with Mark Polk: Are Towing Laws Outdated? I have always been an advocate for towing safety, whether it’s towing a trailer or towing a vehicle behind a motorhome. One of the most controversial topics I have run into is whether vehicles being towed behind motorhomes need to have a supplemental braking system. My argument is if the state that you reside in has laws requiring a trailer over a certain weight to have brakes; this would also apply to a vehicle being towed behind a motorhome. Another argument is that many state towing laws are antiquated and need to be updated. When some of these laws were written people weren’t towing vehicles behind motorhomes. The brakes on a motorhome are designed by the vehicle manufacturer to stop the weight of that particular vehicle, not the additional weight being towed behind it. This additional weight adds a substantial increase to the distance required to stop safely. And, even if the motorhome is capable of stopping the vehicle the added stress from the force on the tow bar and hitch, when the vehicle doesn’t have brakes, can result in damage to the tow bar or separation from the hitch. Some motor home chassis warranties are voided if you tow over a certain amount without a supplemental braking system. I’ll go even one step further. I am not a big fan of the Federal government regulating things that individual states should have control over, but when it comes to trailer towing laws I do believe the laws should be the same for every state. Trailers need safety chains, lights, proper hitchwork and if it weighs over a certain amount it needs brakes, period! It makes no sense that a trailer would need brakes in one state but not in another state. Why do we need 50 different sets of guidelines and laws regulating the operation of a trailer? After analyzing a five year history of data collected through the National Highway Traffic Safety Administrations General Estimates System I discovered that on average there were 68,358 accidents involving passenger vehicles towing trailers per year. The average fatalities from accidents involving trailers are 446 per year. The average numbers of injuries from these accidents are 24,506 per year and the average instances of property damage resulting from these accidents are 43,405 per year. To me this is unacceptable. It would be my guess that the majority of these trailer related accidents involve smaller utility trailers that the average homeowner might have, trailers used in construction and other businesses, horse trailers and of course boat and RV trailers too. The bottom line is there is no excuse for these kinds of statistics. I see unsafe trailers on the road all the time, but the way I see it is in most cases it is a lack of education or understanding of what is involved to safely and properly tow a trailer, regardless of the size or type trailer it is. 1) What is required to be on the trailer i.e., safety chains, lights, break-away switch (with a charged battery)?2) How much can a trailer/vehicle weigh before it needs brakes?3) What type of hitchwork do I need? Half of the battle to safe towing is using the proper equipment. The other half is enforcement. Law enforcement officers need to be trained on what the laws and requirements are for safe trailer towing and then enforce the laws. There is no reason for over 68,000 accidents and over 440 deaths a year involving vehicles towing trailers. That’s how I see it, how about you? Watch the video for information on safe towing procedures.